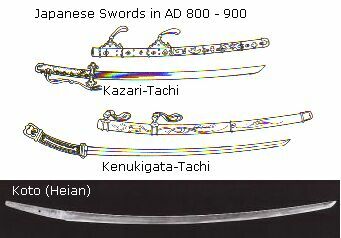 Straight swords were from China, started making straight swords and dominated until beginning of AD 900. 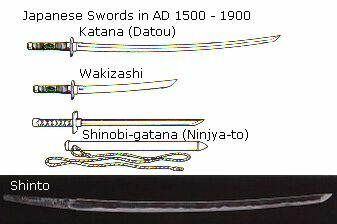 The shape of Swords had been changed from straight style to curved style in mid (Koshidori) with slim type blade (Hosomi), evolving sword making process as well as functionality. 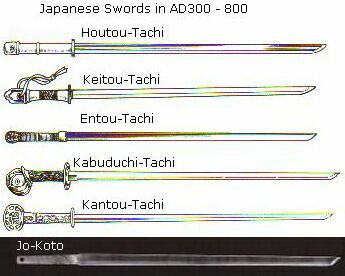 Kazari-tachi was made for ceremonial purpose and other type of Tachi was used among Kuge (imperial family and aristocrats), later became origin of Japanese warrior "Samurai," called Kuge-Samurai. 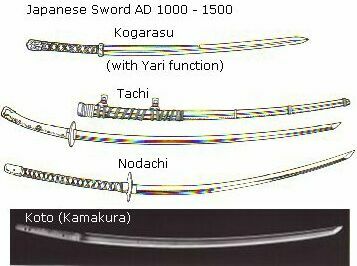 Tsuka-ito was started used in Tsuka, and blade curve (Sori) became greater with thicker blade, ideal for cavalryman's sword. Blade length over 1m (37 inches) called Oh-dachi, less 66cm (26 inches) called Kodachi. Samurai started joining lower rank aristocrats, and gaining political power in both central and local area. started Samurai culture, infruencing political power. The Blade curve had been moved to center to tip (Sakizori) with shorter length 64cm (25 inches) for ground fighting purpose, Samurai dominated in various province and many political fighting were changed and brought entire Japan in war, and many different type unique weapon were appeared. In addition, Handachi was started as battle field mount for horse back riding fight, in mostly middle rank Samurai, and early Handachi mount was just like modified Kazari-Tachi style mounting.